Adding a pond, waterfall or pondless water feature is an excellent way to enhance both your outdoor and indoor living space at your Omaha residence. Water features add an elemental beauty to any outdoor landscape creating both beautiful aesthetics as well as calming ambience to help you relax and enjoy your backyard. HH Landscape can design and install custom water features that are tailored to meet the aesthetic and decor of virtually any outdoor space from modern, sleek pieces to stunning classics. Water features are one of the most popular additions during a landscaping renovation as they make any atmosphere seem more affluent, polished and cultured. Unwind to the sounds of trickling or bubbling water help to alleviate stress and provide a calm atmosphere. Whether you have a water feature idea in mind or you want to explore your option with the professionals, HH Landscape can help you find a water feature that you’ll be excited to show-off. Building a pond, waterfall or pondless water feature involves many intricate details. There are virtually endless possibilities when it comes to designing the perfect outdoor water feature for your home, and the ideal piece may vary based on your decor, space, and upkeep. That’s why the Omaha landscaping experts at H & H Lawn & Landscape will handle every step of the way from design to producing the finished product for your backyard or patio area. We can help you determine what color rocks to use – and how it will fit into the rest of the surrounding landscape such as decks, patios and flower beds. 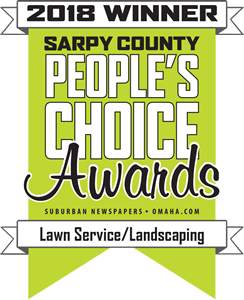 Contact our team of Omaha landscapers to set up your free landscape consultation or to discuss water feature additions for your home. We work closely with each and ever client to understand their unique personal style, preferences, and budget. Tell us about your landscaping ideas, and we’ll help transform them into reality! Call (402) 916-9500 to chat with our team.